On June 3-4, the Meteor Sport Complex in Dnipro hosted one of the largest tech events in Ukraine, BestRoboFest 2017. 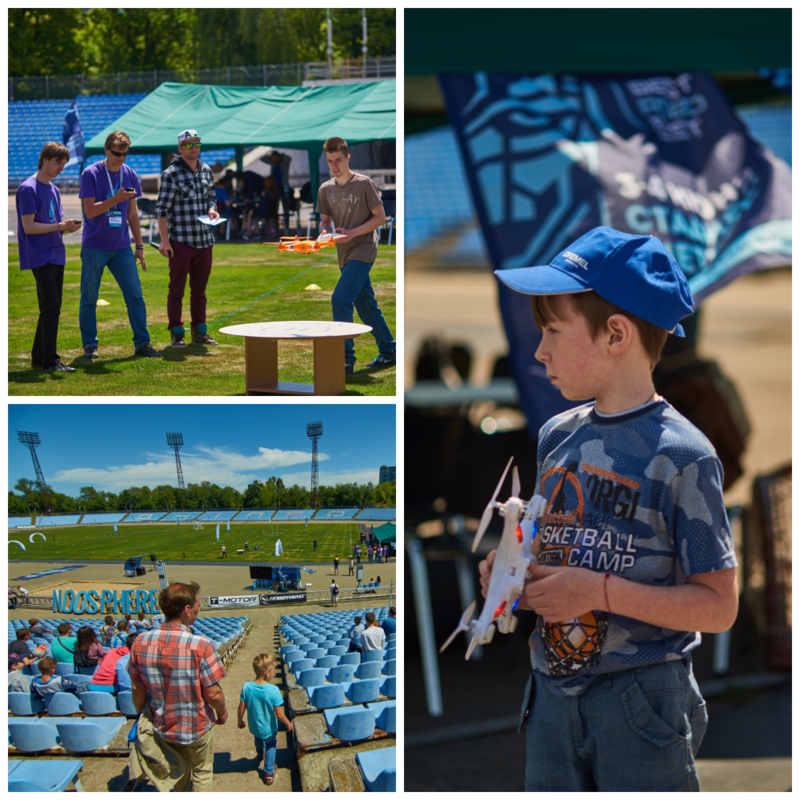 As a festival of technology, innovation and robotics, this year’s event program included a variety of robot design competitions, presentations of modern technology solutions at expo-zone, the drone racing championship, open air action at art & play zones, and much more to see, participate in and enjoy. BestRoboFest is organized by Noosphere and this year’s event showed that the annual event is gaining strong momentum. This year, young engineers from all over Ukraine demonstrated 187 robot models to the joy of 10,000 the visitors who attended the event of the 2 days. Organizers were delighted by the leap forward over last year, both in attendance and presenters. Each competition had its own range of sub-categories varying in age, theme, tech complexity and specifications. With a total of more than 30 different competition nominations, there was plenty of competitions and prizes for humans and robots alike. The entire soccer stadium at Мeteor was transformed into a playground for the copters and their masters. This was a perfect fit. The stadium field gave organizers enough space to create a challenging race track that put the mastery of the 25 pilot teams to the test, while the stands were able to accommodate the crowds of viewers who joined the air show. There was also a chance for anyone who felt inspired by the competitions to try on the shoes of real engineers. Participants could attend a wide-variety of free workshops that were available over the 2-day festival, including robotics hardware and software design, robotics basics in WeDo and Arduino, drone piloting, 3D printing, and amatuer rocketry. For those who came at BestRoboFest to watch, rather than compete, there was an expozone of technology breakthroughs. Along with a number other cutting-edge labs and companies that presented their technologies at the expo, the Noosphere Engineering School showcased the results of the projects they have developed, such as the charging service for mobile devices, PowerBox, a device for transmitting tactile sensor data via the Internet, SenseBridge, a laser clock, a Mars Rover, the artillery fire control system, ArtOS, and a mobile application to contact the police, MyPolice. On top of that, the crowd had the chance to talk live with the robots AlphaS1 and NAO and check out a spy-robot, an ultrasonic glove and a smart street light in action. Keeping with the tradition of a family-oriented event, BestRoboFest had many other activities for people of all ages and interests. Part of the event was designated a special play zone for young enthusiasts to play outdoor games like twister, frisbee and other fun activities prepared by volunteers. Guests could enjoy a variety of delicious cuisines at the food zone, while watching the battle between street food vendors, or try their luck in a burger eating contest. The art zone at the festival was a hit throughout the festival. Three groups of modern artists portrayed their vision of robo-art on three huge 2m x 3m сanvases. Guests joined in with paint and their imaginations on two more similar canvases to share their vision. The end result was a collective painting where every stroke and dash became part of their memory of BestRoboFest. Urban sketchers lost themselves in the hustle and bustle of the event and produced a treasure trove of sketches covering every aspect of the event. To keep the energy level up, live bands played from the main stage throughout the event. During the day, the stage was home to teenagers from local singing and dance schools who gave concerts. As evening came, the baton passed to local music bands that played original music and covers of popular hits. A special note should be made for this year BestRoboFest’s special exhibit – a monster vehicle exhibit by MonsterCarsUA. The unique collection captured the attention of anyone who passed by. The expo was held in the form of a contest for the most creative custom vehicle design. 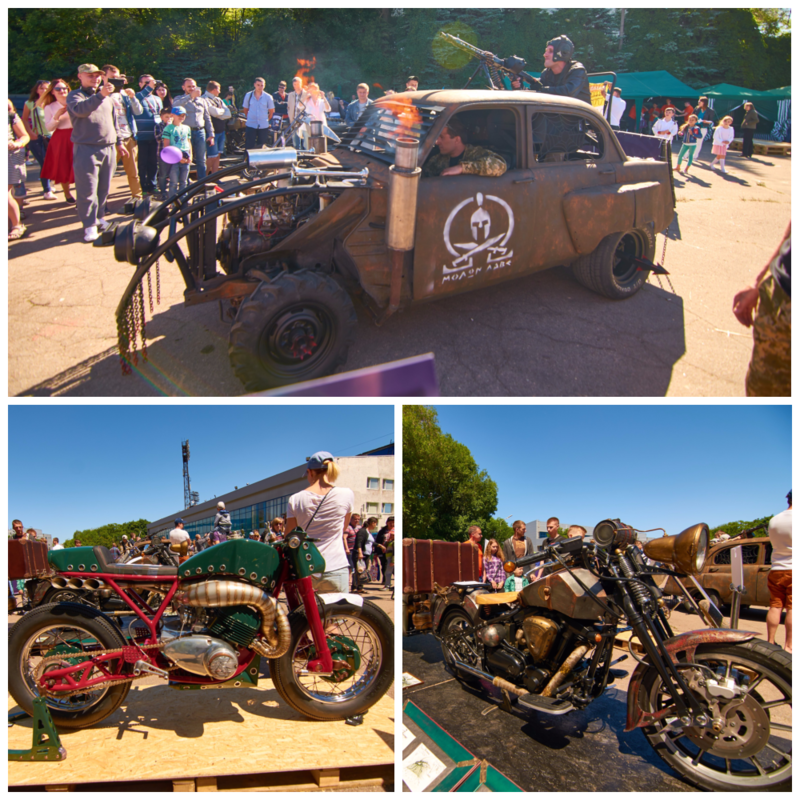 The exhibit included variety of bikes and cars from leading Ukrainian custom shops, self-designed recumbant bicycles, choppers, buggies, a “Bigfoot” truck and a postapocalyptic style car that could have come straight out of a Mad Max movie. In total, 17 engineers put their custom designs on display for the public and the judges. MonsterCarsUA was an open contest for amateurs or professional, custom engineers. Everyone had the chance to earn prizes and public acclaim. Third place went to the “Beckman” bike, designed by Jaroslav Lutitsky at Kharkiv customs ICM, a former world champion in cafe racer bikes. Second place was taken by Alexey Kodents for his fire-breathing Mad-Max-style vehicle “Thrasher”. Anatoly “ZbochinetS” Eremeev, with his steampunk bike drove up to the highest step of the pedestal and took first place. To encourage custom designers, Noosphere set up cash prizes of $5000, $3000 and $1000 for first, second and third place winners respectively. On top of the main monster vehicle exhibition this year, a foundation for MonsterCarsUA 2018 was laid as well. As the winner of the “pimp-my-ride” online voting, Anatoly Eremeev received a grant to complete a new project to exhibit next year. The project is called “343 Track” and is expected to look like a Frankensteinesk, tractor-tow truck that will resemble the truck from “Jeepers Creepers.” To add to the audience’s delight, a local legend ZAZ-965 will be used as the basis for the customization and the whole process will be documented and presented in the future. In the end, MonsterCarsUA almost stole the show at BestRoboFest 2017. Incorporating such a beautiful addition to the festival will help cultivate engineering сreativity among people of every age and drive the development of the ecosystem as a whole. It would be hard to find a better way to get youth involved in engineering and to foster excitement than by launching spectacular shows like this.